This box and stand (the two are joined and cannot be separated) are of carved wood but decorated in orange-red lacquer with applied mirrored glass fragments. 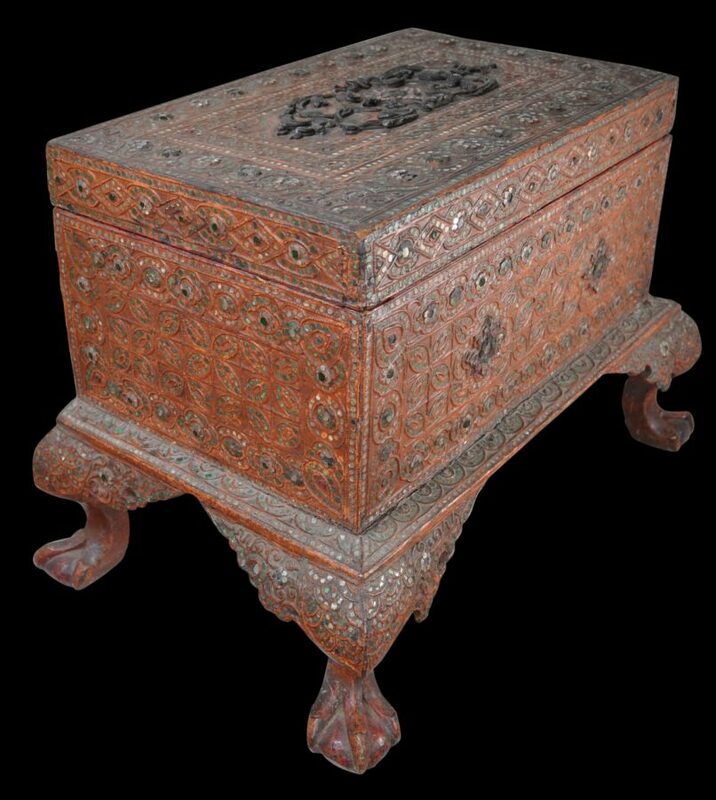 Such boxes and stands from Burma were intended to hold manuscripts but traditional Burmese Buddhist manuscripts typically are long and thin. 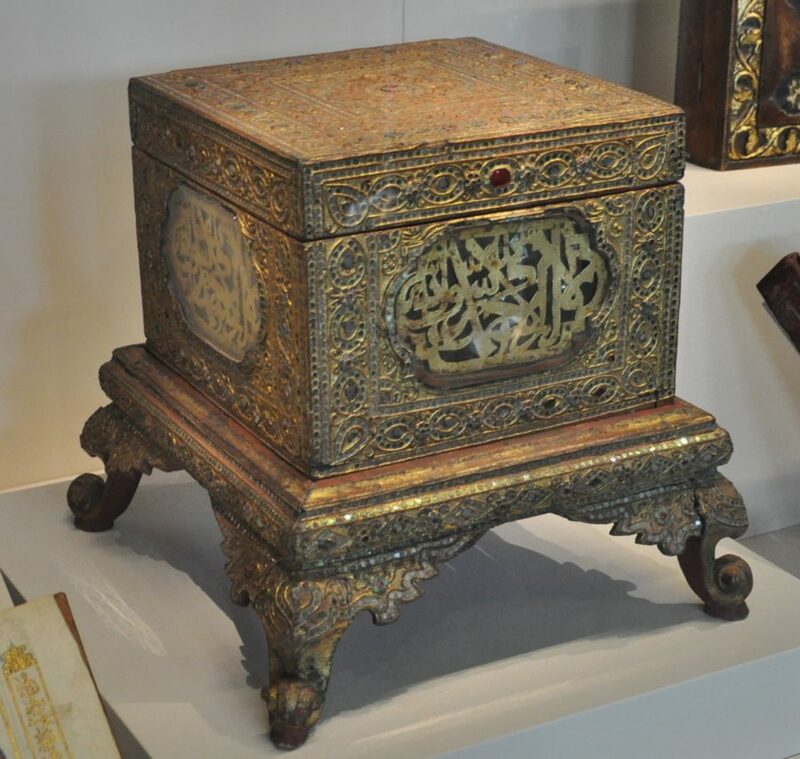 The dimensions of this box are more in keeping with a Koran and so it is possible that this box was intended to store a Koran. 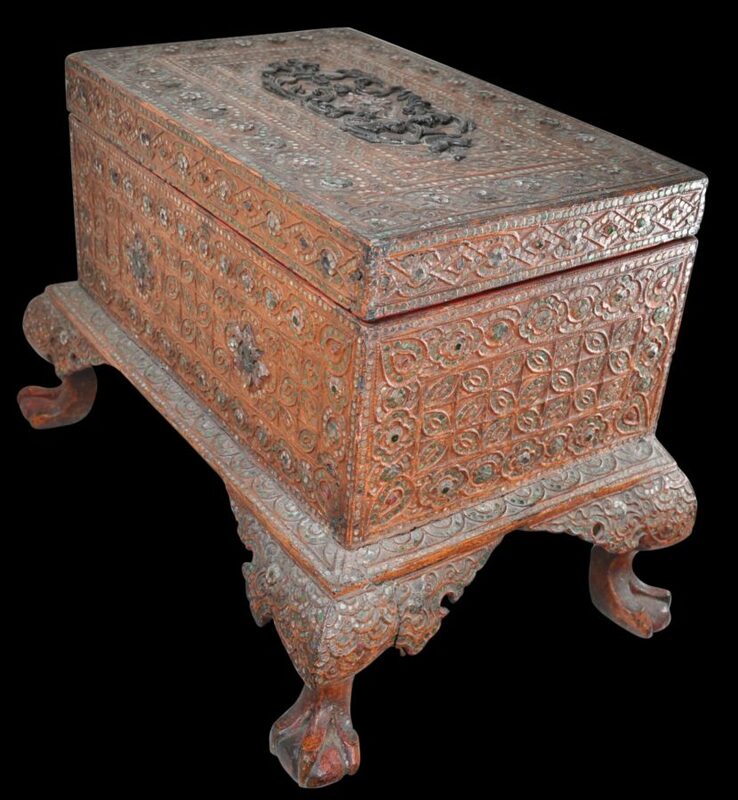 The etiquette of respectful care of valued Korans is such that they are stored among Southeast Asian Islamic communities in elaborate boxes befitting their status. Also, the decoration is more in keeping with that from Rakhine (Arakan) state in Burma’s far west. This the state the traditional has had Burma’s largest concentration of Muslims. 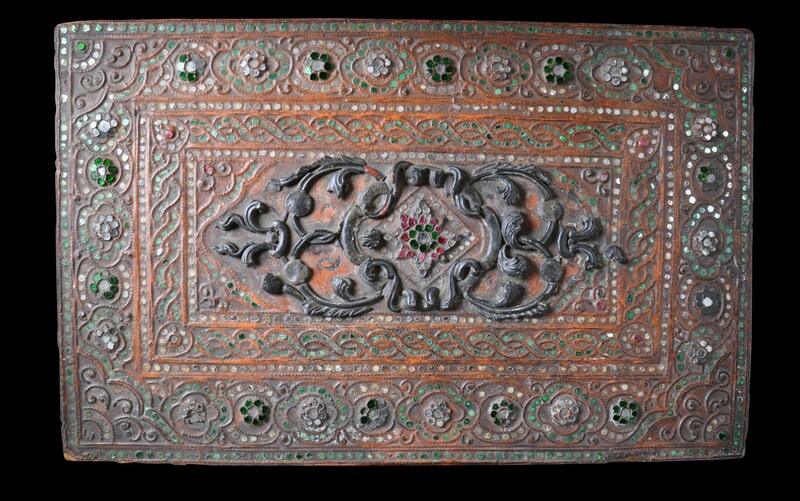 The use of green foil to back the glass fragments is in keeping with Islam, as are the geometric and repeated trellis motifs as opposed to more idolatrous figurative forms more commonly seen on Burmese lacquer. The mirrored glass is also arrayed here and there as stars, further suggesting a possible Koranic use for the box. 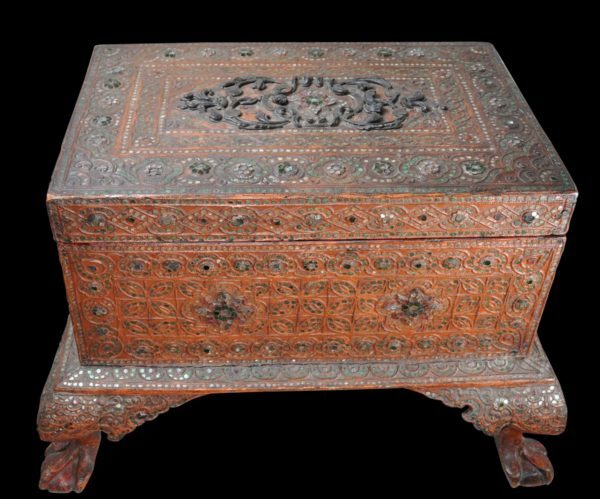 The box and stand are entirely covered in moulded lacquer-work in relief (known as thayo work) and have been inlaid with small pieces of glass backed with red, green and silver foil (a process known as hman-zi swei-cha). The stand has four ‘ball and claw’ feet. 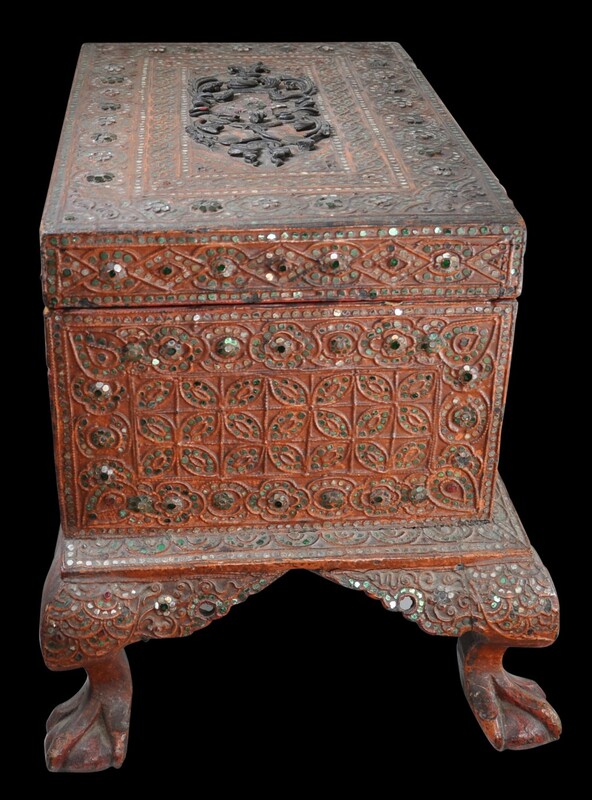 The lid has a particularly attractive central panel in dark thayo work in especially high relief. 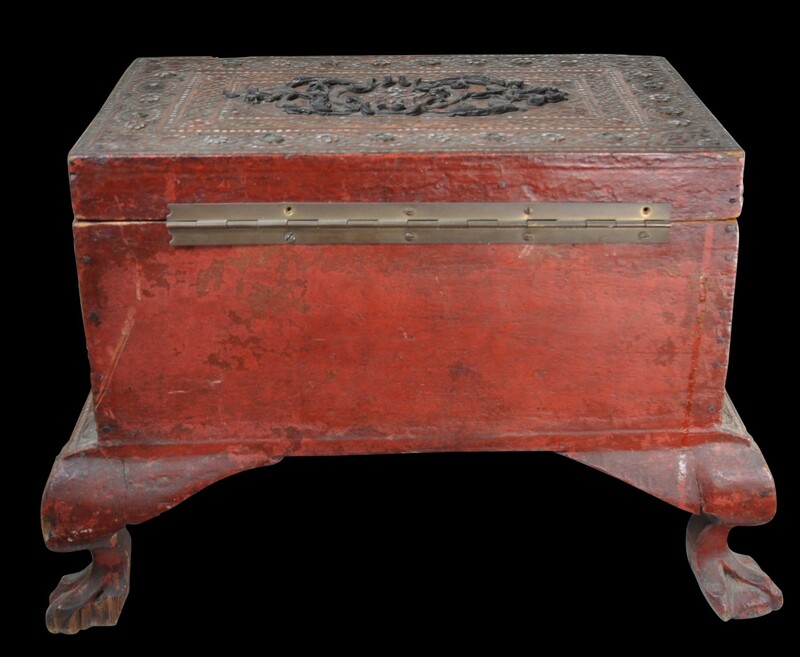 The box is hinged; the current hinge is later. 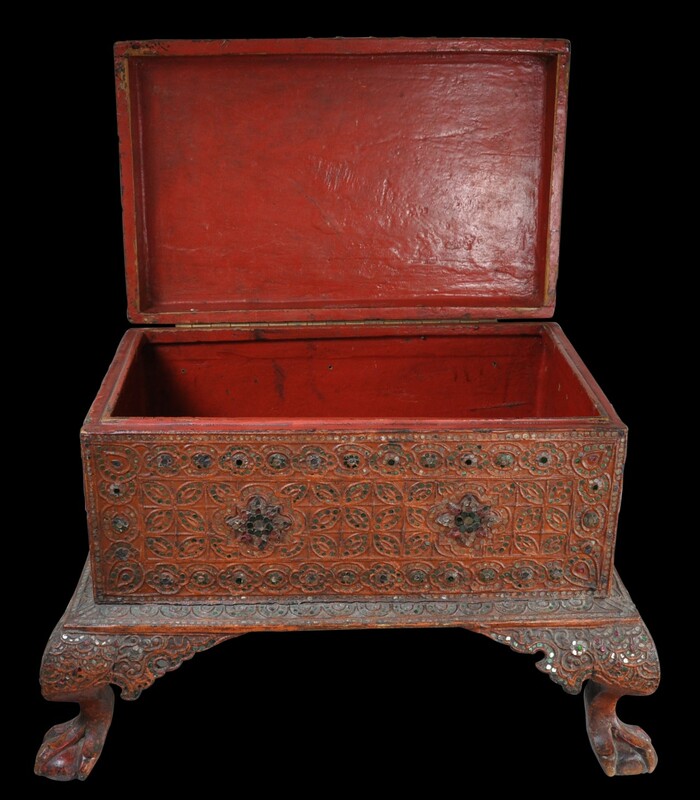 The interior is of red cinnabar lacquer. There is a precedent for using such a box in Burma for a Koran. 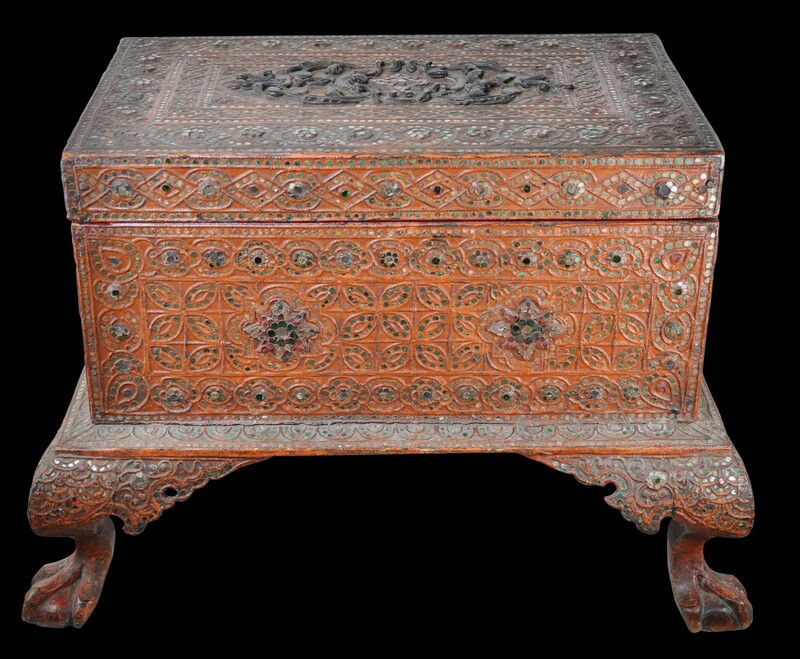 The final two images show a very rare example in Singapore’s Asian Civilisation Museum. 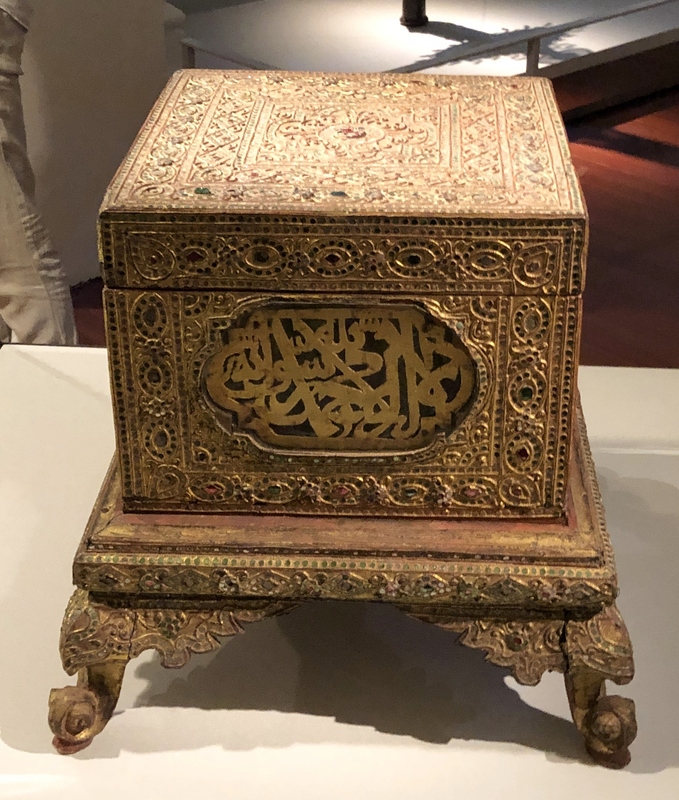 This example has similar proportions to the example here but its use to store a Koran is very clear: it has panels of Islamic script set into the sides which otherwise are decorated in a traditional Burmese style. This piece is also illustrated Bennett (2005, p. 85). The example here has minor, expected losses to the lacquer, and there is some old loss to the carving of one of the rear feet, but overall, it is a fine piece with a sculptural presence and a lovely patina.